(Bloomberg) -- Investors who are on the verge of buying Saudi Arabian shares for the first time should be ready to reach deep into their pockets. The biggest stock market in the Arab world, which will begin to be included in the emerging-markets group by index compiler MSCI Inc. next month, is trading at the most expensive level compared with the category since 2015. 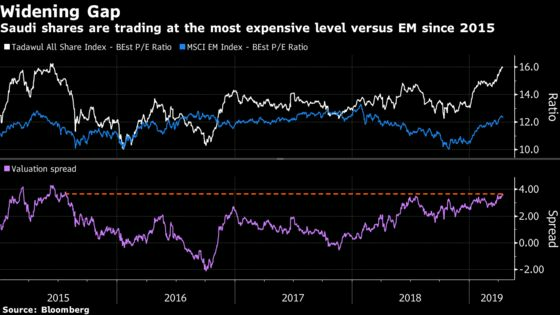 The ratio of estimated price-to-earnings in the next 12 months for the main Saudi gauge is 16 times, against 12 for the MSCI Emerging Markets Index. The $568 billion stock market has been attracting foreigners as they position for the inclusions by MSCI, over two tranches, and by FTSE Russell, which is already underway. The stocks could get even more expensive as the MSCI addition alone is expected to attract as much as $11 billion once fully implemented, according to estimates by the stock exchange.